On August 11, 2012 Karen's husband (Derek Lahey) and best friend (Wendy Hallgrimson) surprised her with a benefit concert to recognize her battle with TTP. The all ages event featured The Fighting Hellfish, Vesely Couture and Los Luchadors Tamboreros (Derek's band). 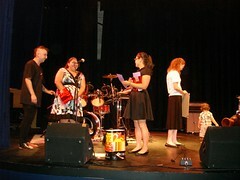 The bands generously donated their time to entertain the crowd of supporters at the West End Cultural Centre in Winnipeg, Manitoba. When asked why Derek (Karen's husband) and Wendy (Karen's best friend) decided to spend months organizing this fabulous event, they both remarked on the need for awareness for TTP to save lives. So many TTP symptoms can be explained away by more common non-serious conditions. Karen's fatigue and nose bleeds symptoms did not seem alarming at the time. Her exhaustion could be easily explained away by having a new baby at home. Her nose bleeds were not new to her, as she had experienced them in the past. 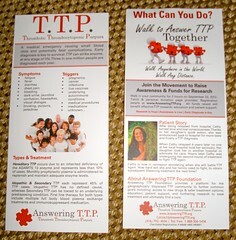 All event participants received the new TTP info card and were encouraged share it with their friends. 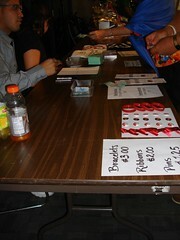 The Foundation also supplied awareness bracelets and ribbons for the event. Also available for sale were buttons designed by the event organizers. The concert marked the first entirely 3rd party organized fundraising event to benefit Answering TTP Foundation. I was thrilled to attend to share information about TTP and the Foundation support, education, advocacy and research initiatives. It was amazing to see the Answering TTP Foundation tools being used by others to engage their local community to raise awareness and funds for TTP. We hope that the Carin' 4 Karen event will become an annual fundraising event! We wish Derek and Wendy the best of luck with the follow up Winnipeg blood drive on September 8 from 8am - 2pm at the Canadian Blood Services building, 777 William Ave. Make your appointment today at www.blood.ca and register for our Partners for Life team! 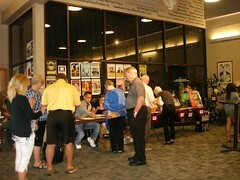 For more information on how to organize an event to benefit Answering TTP Foundation, please visit www.AnsweringTTP.org.